With the growth of nuclear power plants and ongoing projects to increase the electricity production from nuclear reactors in developing countries has created significant demand for nuclear feed water pumps. Demand from under construction and existing nuclear power plants is set to drive the growth of feed water pump market. It is expected that more than 20 new reactors will come online during the period 2016-2024, which indicates a growth in demand for feed water pumps across the globe. There will also be substantial demand for feed water pumps in the aftermarket as many of the existing reactors will require replacement as most of them are 20 years old and require significant refurbishment. Hence, aftermarket demand for nuclear feed water pump will also play a key role in the feed water pumps market growth. Moreover, about 40 countries are planning to develop nuclear commercial power facilities in the long term which will surely contribute to the growth of the commercial nuclear market and associated industries. Goldstein Research analyst forecast the global nuclear feed water pump market to expand at a CAGR of +6% during the forecast period 2016-2024. The demand for feed water pump in nuclear reactors around the world reached USD 2.0 billion in 2016, which is likely to reach USD 3.2 billion by the end of the forecast period. The report covers the present ground scenario and the future growth prospects of the nuclear feed water pump market for 2016-2024 along with the total revenue of nuclear feed water pump industry in every region. We calculated the market size and revenue share on the basis of revenue generated per segment, regional and country level. The revenue forecast is given on the basis of number of nuclear feed water pump manufacturers and current growth rate of the market. Based on reactor type, pressurized water reactors accounted for the largest revenue of more than 52% in global nuclear feed water pump market in 2016. Moreover, pressurized water reactor segment is expected to dominate the market over the forecast period owing to planned and under construction projects of pressurized water reactors across the globe. Global Nuclear Feed water pump Market Outlook 2016-2024, has been prepared based on an in-depth market analysis from industry experts. The report covers the competitive landscape and current position of major players in the global nuclear feed water pump market. The report also includes porter’s five force model, SWOT analysis, company profiling, business strategies of market players and their business models. Global nuclear feed water pump market report also recognizes value chain analysis to understand the cost differentiation to provide competitive advantage to the existing and new entry players. Our global nuclear feed water pump market report comprises of the following companies as the key players in the global nuclear feed water pump market: Areva, General Electric, Alstom Power, KSB Pumps, Bharat Heavy Electricals Limited, Flowserve Corporation, Westinghouse Electric Company, Mitsubishi Heavy Industries, Hitachi Plant Technologies and Sulzer Pumps. According to our global nuclear feed water pump market study on the basis of extensive primary and secondary research, one major driver in the market is growing demand for clean and efficient electricity production to meet the growing demand for electricity. Many countries across the globe have adopted the nuclear energy to generate electricity and have various ongoing and planned projects. For instance, India and China have approximately 30 under construction and about 60 planned nuclear reactor projects which will positively impact the growth of nuclear feed water pumps market. Further, the report states that one challenge in global nuclear feed water pump market is the requirement to reduce the energy consumption of pumps, which affects the efficiency of nuclear reactors and the energy consumption of these pumps accounts for more than 40% of their operating or lifecycle cost. Geographically, Europe accounted for the largest market share of 41% revenue in global nuclear feed water pump market owing to presence of more than 180 operational nuclear reactors and major manufacturers in the region. Europe is closely followed by the Asia pacific region, which occupied about 32% of the market share owing to presence of significant number of nuclear reactors in the region. 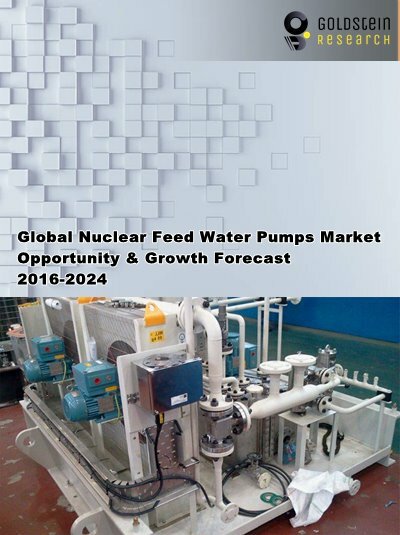 Latin America, Russia and Asia Pacific region provide the vast potential for the nuclear feed water pumps market growth owing to aggressive persuasion for nuclear power generation.